“For nearly 40 years, (Iran) has been responsible for a torrent of violent and destabilizing behavior against the United States, our allies, our partners, and indeed the Iranian people themselves” – a US/NATO/Israeli/Saudi speciality, not how the Islamic Republic operates. Trump “withdrew from the flawed Iran nuclear deal, which failed to restrain Iran’s nuclear progress or its campaigns of violence abroad” – bald-faced lies. The Islamic Republic abhors nuclear weapons, wanting them eliminated. Nuclear armed and dangerous America and Israel risk WW III with nukes, the ultimate nightmare scenario. The world community strongly supports the JCPOA. Unanimously affirmed by Security Council members, it’s international law the Trump regime flagrantly breached by its illegal pullout. 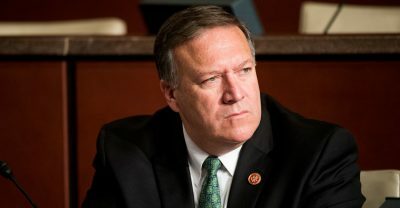 Trump “instituted a campaign of pressure, deterrence, and solidarity with the long-suffering Iranian people,” Pompeo roared. The Trump regime is in “solidarity” with dark forces at war on humanity at home and abroad alone, disdainful of ordinary people everywhere. “(C)hanging…Iranian…behavior” Pompeo called for is code language for regime change, wanting Islamic Republic sovereign independence replaced by unacceptable pro-Western puppet rule. The “Iranian threat” he claimed doesn’t exist – other than its government standing in the way of US control of the country, its valued oil and gas reserves, as well as its people Washington wants exploited the same way it mistreats populations elsewhere abroad as well as at home. Separately, Trump said he’s willing to meet with his Iranian counterpart without preconditions – a hollow gesture. His JCPOA pullout, reimposition of nuclear and other sanctions, stiffer ones to follow in November, formation of the Iran Action Group, along with other policies aimed at destabilizing and toppling the Islamic Republic show his regime’s real intentions. Trump’s political and economic war on Iran, notably his JCPOA pullout, reimposition of sanctions, and orchestration of destabilizing activities leave no room for dialogue. It’s only possible if his regime acknowledges nearly 40 years of US hostility toward the Islamic Republic. Trump repeatedly proved he and his regime can never be trusted. The same goes for Obama when in power, responsible for breaching the JCPOA multiple times – proving undemocratic Dems are as untrustworthy as Republicans. US dirty hands are behind efforts to destabilize Iran by orchestrating unrest in the country, aiming to topple its government by color revolution – what was tried before and failed, unlikely to succeed this time. The Iran Action group aims to stoke internal unrest more intensively than earlier Trump regime efforts – US war on the Islamic Republic perhaps to follow if coup d’etat actions fail. Khamenei, Rouhani, and other Iranian officials justifiably believe negotiating with a nation bent on achieving dominion over planet earth can accomplish nothing.